I have been riding CB450's for almost 4 years now. It's a dual overhead cam motor with little things called "torsion bars" instead of valve springs. I became fascinated with the engine design, and the engine design has become fascinated with my wallet! I now am on my second CB450, since I was rear-ended while riding my first one. While these bikes were once considered big displacement bikes, many consider 450cc's a little underpowered for today's cars and highways. The speed limits are higher, and people don't even observe them anyway! Add over 40 years of time for poor maintenance, weather, and other outside effects, and it becomes apparent these old bikes need some love from their current owners. Luckily for my bike, I have a hole in my heart that's the shape of a Honda CB450. As fate would have it, the previous owner of my CB decided to "rebuild the top end" without installing a new cam chain, new valve seals, and the starter skipped teeth, it was setup all wrong. Had these things been addressed and "rebuilt" properly, my little Honda would have happily purred past 20,000 miles without needing more than regular maintenance. These bikes are like anything else, treat them how you're supposed to, and they'll last forever. This was not the case, in fact my bike decided to scatter pieces of piston, connecting rod, cylinder wall, starter motor and engine cases all over St. College in Fullerton. While at the time all I could think of was how my 3500 mile 1969 CB450 was toast for the summer, my wrench monkey hands started trembling in anticipation. I got the bike home, ripped the engine out, and dismantled what wasn't already destroyed. All I was able to keep was the cylinder head. Luckily, I found a parts bike from some weirdoes with a low-mile engine for 200 bucks. 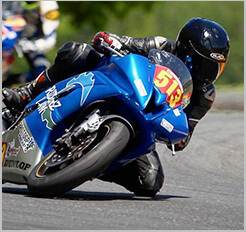 Last summer, Wiseco came out with high-compression forged pistons for the CB450. 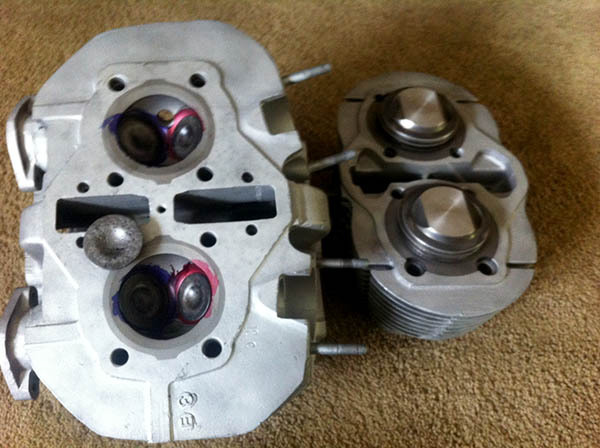 I decided to go for the pistons and got my machine work done once they arrived. I assembled it last August, and it was great fun for over 5000 miles. The pistons required the timing to be retarded about 3 degrees, but the bike ran great once again. But things can never be so simple, can they? The saga of the CB continues. After a few months, I noticed a little blue smoke from the left exhaust on startup. Then I noticed it on deceleration and hard acceleration. It had a pretty high rate of oil consumption. Maybe a quart of oil per 300 miles. I expect a little oil burning in these air-cooled bikes to be normal, but something was definitely not right. The symptoms pointed to bad valve seals, which I must say is the weakest link on the CB450. The design is like a little hat that sits on the valve guide, instead of the widely used Viton type seal that mounts right to the guide. Perhaps due to the high compression, the seal was working past its operational limits and started to let oil down through the guides. My spark plug holes were also hideous and ready to strip, so I decided to tear it down once again about a month ago. This time, I'm doing it without any room for error. I've got a low mile cylinder head, all the valvetrain components are well within spec. The cylinders just need a light hone. I've got 2 new sets of rings, a new cam chain, a gasket set, and oil seals. My machinist has cut the valves for a tight fit. He also decked .002" off my pistons to reduce the compression to 9.5:1 instead of 10:1. What I am most excited about is the bronze valve guide set Schuman Motorworks has machined for me, which comes with Viton seals. Shouldn't have any more issues with the valve seals or oil burning. I can't wait to get it all assembled in time for the Summer. This is my most expensive build yet, and I am not going to let failure, or those pesky valve seals, get in my way.